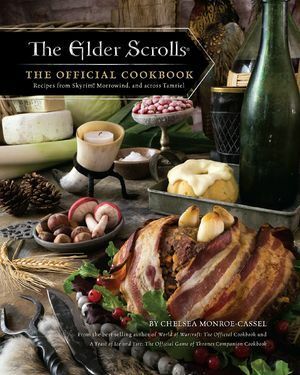 On January 30, 2019, Chelsea Monroe-Cassel, author of The Elder Scrolls: The Official Cookbook held an Ask Me Anything at the r/skyrim subreddit to discuss the book and her work. Livelynightmare: Skyrim cooking recipes are obviously very simplified (since nobody wants to have to carry around 20 ingredients to make a soup in a video game about killing dragons), so did you try to keep the recipes equally simple or did you see it more as an opportunity to use the game's recipes as a base upon which you could creatively build? IatC_Chelsea: I think that the Elder Scroll cookbook might be one of the most approachable collections of recipes I've put together so far. There are definitely some unusual things, but in general it's just straightforward tasty food. I did obviously start with the dishes in the games, and when available tried to include the in-game ingredients, but then I had a lot of filling out to do, with balancing types of dishes (mains vs. desserts), ticking some personal boxes (is there a bread recipe? what about a hot drink? ), and that sort of thing. Livelynightmare: Did anything seem really out of place or anything like that? For example, about a week ago, someone was asking about Skyrim-based recipes here and our good friend u/Ghawblin had to warn someone that using a cup of nutmeg in a recipe, as instructed via a book in the game, will literally kill you. Livelynightmare: I also just had an embarrassing revelation. I don't think anyone here asked you what your favorite food is. It's such an obvious question that I didn't even think of it. IatC_Chelsea: Mac and Cheese, or PB and Honey/black raspberry jam sandwiches. I was a remarkably picky eater as a child, but spending a year abroad in Turkey cured me. Best food in the world, along with maybe Italy. Theskyrimjob: Why aren’t you a chef? What’s the matter, someone stole your sweet role? IatC_Chelsea: I don't have the temperament for it! ;) Nor the interest, nor the qualifications. I like the research and staging more than the actual cooking, some days! KafkaOnReddit: What are the recipe you found more difficult to recreate irl? IatC_Chelsea: There are always a handful of recipes with every project I've done that just keep fighting back! The real trick is knowing when to cut my losses and abandon those dishes in favor of actually meeting deadlines. ;) For ES, there were a number, but the couple that most annoy me still are those really interesting cocktails from Riften- I just couldn't make them workable and easy! But because it still bothers me, I might revisit them when I get a chance for the blog. IatC_Chelsea: It's when no matter what I try, it just won't work, and at some point gets a little worse, not better, with each subsequent attempt. Once in a while I can start from scratch and get something workable, but usually not. DeadQthulhu: You're added as an NPC - what's your race, where's your location, what's your catchphrase, and why? IatC_Chelsea: Ooh, tricky! How did I end up in a character creation page in an AMA? Irritating catchphrase, uttered at irrelevant times: "Well, that's the spice of life..."
dancindani: Do you have any recipes that you recommend for people who are gluten free? Or how to convert recipes to be gluten free? IatC_Chelsea: So, I always try to have a good selection of dishes in the books I work on that are either straight up GF or easily adaptable to be GF- I think the Elder Scrolls book has 50-some recipes that fall into that category. I've had pretty great luck with some of the commercial GF flours that are out there (Bob's Red Mill and King Arthur among them), but I'd love to learn more about baking with alternative flours, too! -xTc-: When taking a fantasy food item and translating it into real life, how much of a challenge is it to make a flavorful dish while staying true to the source material? IatC_Chelsea: That really depends on how much detail is in the source material to begin with! Sometimes (usually in novels) there's a rich description of how it tastes, what it looks like, maybe what ingredients went into it. Video games can range anywhere from, "Here's how it looks, good luck!" to "Here's a detailed list of obscure fictional ingredients that went into the making of this unique meal". It's almost always a challenge to balance between what's canon and what will taste best, but when in doubt, I go with the tastier option. Livelynightmare: Hi Chelsea. Thanks for taking the time to be with us today. I have a lot of questions so I figured I'd ask them individually instead of writing one giant comment. Hope that's cool. So, let's get this party started. Clearly you had to make a lot of substitutions for things that aren't real. Was there one you found particularly difficult to find an equivalent for? For example, maybe you really wanted to do a Horker & Ash Yam Stew but didn't know what to use for Horker meat. It's always a challenge to toe the line between impossible foods/ingredients that don't exist in our world and dishes the absolutely HAVE to go in a cookbook. Horker Loaf was one of the latter, which is how I found myself googling what walrus tastes like one day. For dishes like that, I try to de-familiarize the dish, so when you take a bite, you kinda go, "Huh, what IS that flavor?" Livelynightmare: You must have one wild browser history. IatC_Chelsea: It's super weird. I get a kick out of really confusing both Amazon and Pinterest. Livelynightmare: You seem to stick to themes and games rooted in medieval-fantasy type settings. Is there any particular reason for that? IatC_Chelsea: It's my jam! ;) That's where everything started, with the Game of Thrones cookbook. I love the warm, homey feel of that old wood, pewter, candles, etc. I love to look at those cool modernist food photos, but for me? That old tavern is really where it's at. IatC_Chelsea: YES! Redwall was my first fictional food crush, even when I was a super picky eater child. Friends and I made a Gingerbreadwall Abbey one year, with a whole feast to go along with it. Granted, the quality back then was a bit... different. I think there was vanilla pudding with grated apples in it, or something like that. But I really think that was maybe what started me thinking about fictional food in a serious way. I'd love to revisit some of those dishes on the blog, but HOW do I choose?! Livelynightmare: How would you say the Elder Scrolls cookbook stands up to your other Video Game themed Cookbooks in terms of difficulty and creativity? IatC_Chelsea: Every single one of these cookbook projects has been so different from the last, it's hard to compare them. I will say that I'm immensely proud of this one, though. I worked really hard to make the pictures look like they're from the games, and I think the finished product really evokes the feel of being in those worlds. Ghawblin: Hello Chelsea! Thank you for doing this AMA. Specifically regarding recipes you've transcribed from the Elder Scrolls series, do you think the recipes and foods in the franchise draw inspiration from specific culinary origins (say, German food), are a mash-up of many culinary sources, or are totally unique and fantasy-born? IatC_Chelsea: Hi there! I think that there are definite parallels between ES foodstuffs and some of our real world dishes. Skyrim is probably the best example of that, as so many of the named dishes are very Nordic in feel. The Boiled Creme Treat, for example, is really close in appearance to a couple of desserts from Sweden and Finland. For some of the other cultures, I tried to extrapolate my own real world connections to them to try and build outward in terms of their cuisines. So I looked at their cultures, lore, history, etc. to see what type of cooking fit them best, be it Berber, French, Native American Indian, etc. WraithiusKallari: what's the best food item in the cookbook, in your opinion? IatC_Chelsea: I DO love the sweetrolls, but the Snowberry Cordial is really tasty, as is the White River Salmon. I'm all about the desserts, though, so the Honeycomb Brittle, Spiced Root Cake, and Long Taffy Treat are also up there! -pcgamingmaster-: Is this book Canon? In terms of big picture, you'd probably have to check with Bethesda. It's not an in-world recipe collection, so likely not really. IatC_Chelsea: They've all been really rewarding to work on in different ways- The GoT cookbook was the first, and involved working from historical recipes, which was a blast. The WoW cookbook had these amazing little hotkey images that I tried to match with my photos, so that was a new and fun thing. Hearthstone is full of really good cocktails and snack food, and who doesn't love that?! And now Elder Scrolls, which sometimes had images, sometimes not, but a very clear identity that had to be matched as best I could. Livelynightmare: Did you make any of the food items from the games that aren't available as recipes in-game, like the Boiled Creme Treat or Homecooked Meal? If so, did you just kind of wing it or base your creation off of what it looks like in the game? IatC_Chelsea: Oh, definitely! I basically started with three lists: the first was actual dishes that appear in the games (sweetrolls, Elsweyr fondue, etc. ), the second was ingredients (red apples, potatoes, ash yams, etc. ), and the third was anything that could plausibly be ingredients or garnishes (void salts, various flowers, etc.). When there were images from the games, I matched as well as I could, and then for the rest mixed and matched from the second and third lists to make dishes that fit in the worlds. Livelynightmare: When it comes to something like Elsweyr Fondue, how do you distinguish it from a basic cheese fondue? IatC_Chelsea: Well, I think in the game it has a pinch of Moon Sugar, but that leads down another rabbit hole! I tried some sweetened versions, but in the end settled for a pretty straightforward fondue recipe. Livelynightmare: Have you ever considered anything like a compilation book of sorts, featuring a collection of dishes from all sorts of media and pop culture, or do you prefer having a singular focus with the guidelines that a game offers? IatC_Chelsea: This was actually my idea for a second cookbook project after Feast! But it turned out to be way too complicated in terms of licenses with different publishers, authors, etc. so it became part of my blog, instead. I like the freedom to explore wherever I feel like cooking with that format, but there's also something nice about the structure and consistent aesthetic of working on one world for longer. Lurk_Derper: Since Skyrim allows you to be a cannibal, did you include any cannibal recipes? (Maybe you could talk with the infamous foot taco guy) What do you think Argonian's taste like? I really wanted to make sure that I included at least one recipe for each race, so there's a Bosmer recipe in there. Up to you what type of meat you choose to use, though! manymensky: Do you feel that the recipes in Skyrim would be a complete diet with all necessary nutrients? What kind physique would one have on this diet? IatC_Chelsea: I'm guessing that vinegar pickled veg would make up for a lot of that, in terms of health. I'd guess that there might be more citrus in the warmer climes, but thank goodness there are tomatoes! Fire_Pony: When you were five, what did you think you would grow up to do for a living? Also, if your barn was on fire, which animals would you save first? Also, if your were visiting the Loch Ness Monster, what would you bring as a house gift? IatC_Chelsea: As a child, I think I cycled through a lot of future occupations, but I knew I definitely wanted to rescue animals. I didn't know from what, but if they needed rescuing, I'd be the one to do it. Which dovetails nicely with the second question, I think. I've been terrified of barn fires since watching Black Beauty, but the question is pretty vague. What animals are in there to begin with? Which animals can't get themselves sensibly out? I'd bring the Loch Ness monster a Stargazy Pie- I've wanted to make one for years! Livelynightmare: Were there any dishes that you deemed impossible to make due to the fact that certain ingredients don't have a real-life equivalent? Livelynightmare: Did you encounter any recipes that you just couldn't get to work no matter how many variations you tried to make? IatC_Chelsea: Those cocktails in Riften got the better of me, but I'm hoping to revisit them for a blog recipe! Livelynightmare: How do you decide with finality which theme/game/series to which you're going devote your next book? Do you go from other's ideas, browse for games that have a lot of food, or maybe just make one or two things from a bunch of different games and say "yeah, I like this one here, I'll do that"? IatC_Chelsea: It's a combination! Sometimes a publisher will come to me and ask if I'm interested, and sometimes I'll set my sights on a world I'd love to spend some time in. Serpentking5: Thank you for doing this! So, what what is it like writing a cookbook for fictional food, and what was the hardest in-game food to recreate? IatC_Chelsea: It's challenging in different ways, each time. For ES, I think the Horker Loaf was probably the weirdest to develop, because even if you could get the nearest real world ingredient (walrus), by all accounts it doesn't taste good. And I always try to make sure my recipes are something you'd actually want to eat, because I always eat them after the photos are done! In this case, it's a riff on a meatloaf, with some smoked oysters in it just to give it that "Huh?" factor. It's tastier than it has any right to be! Livelynightmare: In relation to a question I asked about dishes being impossible, were there any that you struggled to make a good recipe for but determined that it absolutely had to be in the final draft of the cookbook no matter what? Like maybe say....apple cabbage stew, which sounds absolutely horrible to me in my head. Livelynightmare: Heyyyy, we're like twins. Cabbage is gross. So are mushrooms. Fight me. Livelynightmare: A lot of more renowned chefs tend to release cookbooks full of recipes with dozens of ingredients and spices that customers typically don't have on-hand, so I was wondering if affordability factors into your ingredients lists at all? IatC_Chelsea: I always try to balance the addition of quirkier ingredients with what folks can actually get. This is harder with some international cooking and with historical recipes, many of which feature spices and other ingredients that have gone out of fashion. I'd hate for people to not be able to make a dish because they can't find the ingredients, but I also want to take folks a little out of their normal comfort zones and introduce them to something they haven't necessarily tried before. Like grains of paradise. That's in my pepper grinder at home, along with cubeb and long pepper, for a wildly more flavorful alternative to normal ground black pepper. OtterIshmael: So the book has various different dishes inspired by the other games/lands of Tamriel so my question is what is your favorite recipe from each region (if applicable), or what your favorite dish overall from the book? PS i adore your Warcraft cookbook and use it often, my friends love the spice mixes and the desserts most! I dithered about whether or not to include spice mixes in the ES cookbook, but I'm really glad I eventually did, because they're really cool! The Imperial mix is sort of Mediterranean, while the Stormcloak seasoning is more Nordic. -The_Sybian-: Greecetings to the real-life Gourmet. In Skyrim, Haelga uses plain old honey and Potions of Enhanced Stamina / Vigor. For anyone not opting to resort to potions, are there recipes between these pages to enhance the Dibellan Arts? Like, for instance, a Whoreker Stew? IatC_Chelsea: For this particular trouble, I'd suggest a serving of Spiced Root Cake alongside a piping hot mug of Canis Root Tea. We are what we eat, after all! Livelynightmare: I've seen you specifically mention staging and photography in a few of your answers here. Have you always had an interest in photography as well as cooking? Was it important to you that you express your vision on your own terms instead of someone else's? IatC_Chelsea: That sort of happened as much by accident as the cookbook career itself, but as a lifetime artist, I think I probably have a particular way of looking at things. It's one of the most challenging but also rewarding parts of the whole process, though, because it's really about storytelling, and setting the food in the world in a believable way. hungryhungryhibernia: What's your favourite recipe in the book? ...And just in case you give me an answer I dont like, what's your favourite recipe in the book that uses meat? IatC_Chelsea: Haha, I like that qualifier! Not sure if salmon counts, but that one's way up there. Otherwise it's a probably a tie between the festival handpies and the Orsimer venison. hungryhungryhibernia: I like the sound of those handpies. I'll let you know how it all turns out once I get my hands on your book! EDIT: Also, bees are very cool. The bros of the insect world. insert_title_here: :0 I'm super late but I've always wanted to keep an apiary!! How did you get started? Is it costly? What kind of honey do they produce/what plants do you provide for them? Please talk about bees, lol! IatC_Chelsea: Oh, they're just fantastic! We had a warm day today, so they were out and about for the first time in months, and it made me so happy. It can be a bit pricey, depending on budget, but I think it's so worth it. Your main expenses are the hive boxes, the equipment/gear, and the bees themselves. Best advice I can offer includes finding your local beekeepers, who are usually organized into some sort of group, many of which love helping folks get started. My other main tip is to get two hives if/when you start out, so you have a reference point for what's normal, and can see if there's something maybe wrong with one of the hives. I'm also all about sourcing bees from a local apiary, if possible, rather than buying a package of bees after they're done with the southern state agriculture circuit. My bees have all kinds of wild forage, since we live out in the country. I actually made two meads last year, one with the spring honey and one with the fall, and they were super different from one another. It all depends on what's blooming when! Keeping the bees has been a steady uphill learning curve, but I wouldn't trade it for anything. They're amazing little creatures! Sptlightstar: I am so excited for this cookbook! Recipes/cooking are one of my favorite video gaming activities. I find it so therapeutic, but when it comes to actually cooking in the kitchen, I get so overwhelmed. For a wannabe baker, what utensils/dishes/tools and ingredients do you always recommend having on hand, should inspiration strike? As for must-haves: I couldn't do without my immersion blender. I don't have an upright blender so that magical tool is what makes all the creamy soups happen. For food photos, some fresh herbs go a really long way, since that little pop of green can really make a photo. Some high quality basic ingredients are also a must, like cinnamon and vanilla, both of which are worth an occasional splurge. PizzaLov3: How do i make a sweet roll? Utubenobb: Is there a recipe for the famous Potage le Magnifique or a reference to the Gourmet? IatC_Chelsea: Sure is! Tastier than I was expecting it to be, too, perfect for frigid winters. CalebHeffenger: Did someone steal your sweet roll? IatC_Chelsea: Psh, I'm in the thieves guild, they wouldn't dare! Livelynightmare: I'd like to know about your process, if you wouldn't mind providing an example of something you've made. For example, once you select a specific dish, what's next? Do you start tinkering with simpler forms of a dish and then build upon it, start writing down ideas and envisioning what works before cooking, or something else entirely? IatC_Chelsea: Sure thing! So, once I have a preliminary master list of possible dishes, I have the very bad habit of always starting with desserts and drinks, which leaves an overabundance of savory dishes for the very end. But I'll look at what I can know or extrapolate about that dish: where do we see it in the game? Is it a rich or poor person's food? Related, does it have any expensive or rare ingredients? Do we know what it looks like? All of that is super important to me when it comes to making fictional food feel grounded. I'll never just take a mac and cheese recipe and tack an unrelated name onto it and consider it a good addition to a recipe collection. Once I've gotten that far, the testing starts- sometimes a dish will work well right from the beginning, and sometimes it has to be tweaked I don't know how many times before it's ready to go. I couldn't eat pork pies for almost a year after finishing the GoT cookbook, for example, since we'd made SO MANY to get the recipes right. TheLollygaggingBlue: When you wrote your book, did you get an arrow in the knee? IatC_Chelsea: No, thankfully, so plenty more adventures ahead for me. I did slog out through deep snow with camera, tripod, and a heap of props to get some of the flavor photos, though. Had to put my hat on the camera to keep it from getting too cold! boblasagna18: Please tell me there’s a sweet roll recipe, I wanna make one for my dads birthday!